The Moldex Special Ops line of tactical products are designed for military, armed forces, federal and local law enforcement, and personal use. The Dura-Mesh shell, exclusive to Moldex protects the filter media so it stays cleaner-looking longer. The shell resists collapsing, even in heat and humidity so the respirator holds its shape longer. The result is fewer respirators used and lower costs. 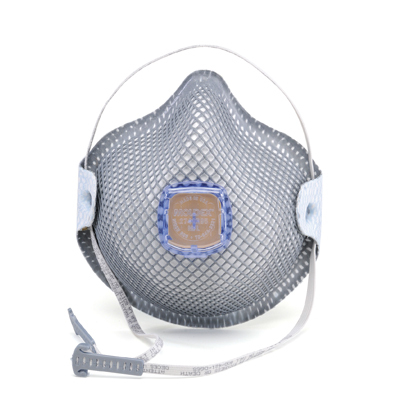 All Moldex masks are contoured to naturally fit the user’s face and with the molded nose bridge there’s no metal noseband to adjust so the seal is maintained without pressure points. Foam nose cushion adds to overall comfort and the exclusive Ventex valve lets the hot air out faster so breathing resistance is reduced and workers stay cooler which means they won’t mind wearing it for an entire shift. HandyStrap allows mask to conveniently hang down loosely and comfortably around the user’s neck when not in use helping to prevent premature disposal, reducing usage and saving money. Plus during wear the elastic cloth strap feels comfortable and cool. Grinding, Torch Cutting, Sanding, Metal Pouring, Sweeping, Metal Working, Bagging, Foundries, Stone Quarrying, Agriculture, Metal Machining, Construction Sites, Cement, Ceramics Manufacturing, Underground Mining, Timber/Lumber Mills, Polishing, Buffing, Lime, Poultry, Textiles, Welding, Brazing, Soldering. For oil and non-oil based particulates.